Clafoutis is a French dessert that sort of looks like a tart or flan but has more of a custard-like consistency and flavour. 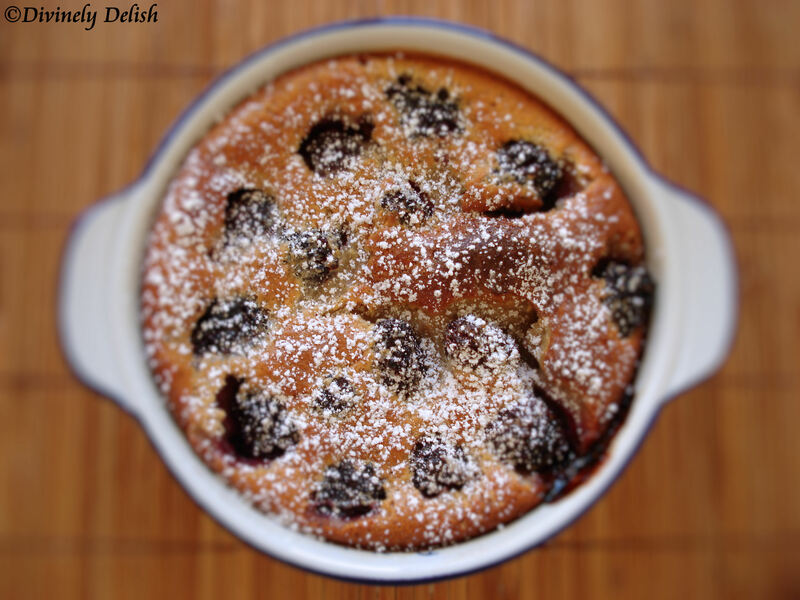 Traditionally, clafoutis is made with black cherries. But you can make variations on this classic dessert by using other berries or even fruits such as peaches and pears. The sweet blackberries and their deep purple colour made this a lovely and simply delicious clafoutis. This was only my second time making clafoutis, but I think I’m going to make it a lot more from now on. I’d forgotten how easy it is! Unlike a tart, you don’t have to make pastry for a crust. It’s not finicky like soufflés. You pretty much just blend all your ingredients together and then pour it over whatever fruit you’re using, stick it in the oven, and – voilà! – you’ve got an amazing, delightful dessert. 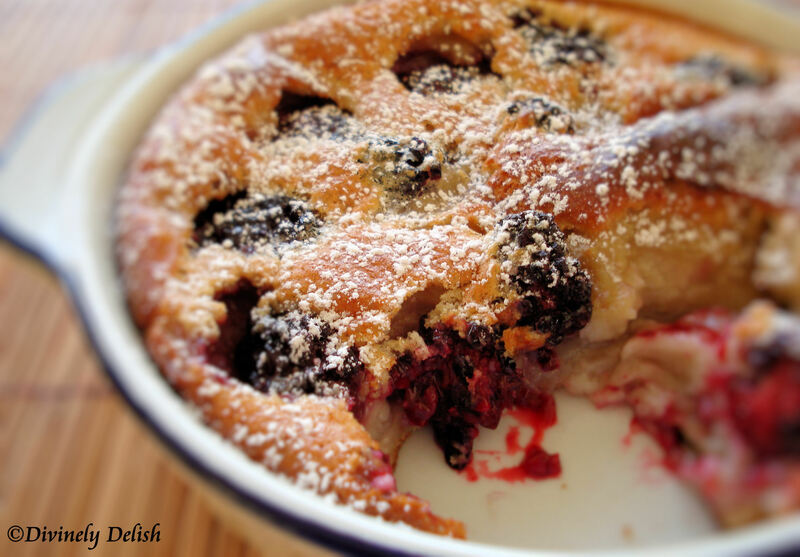 Clafoutis is best served warm, with a sprinkling of icing sugar. 2) Using a blender, combine the milk, 1/3 cup sugar, eggs, vanilla, salt and flour, and blend. 3) Lightly butter an 8-cup baking dish, and pour a 1/4-inch layer of the blended mixture over the bottom. Set remaining batter aside. 4) Place dish into the oven for about 7-10 minutes, until a film of batter sets in the pan but the mixture is not baked through. Remove from oven (but don’t turn the oven off, yet). 5) Distribute the blackberries over the set batter in the pan, then sprinkle with the remaining sugar. Pour the remaining batter over the blackberries and sugar. 6) Bake in the preheated oven for 45 to 60 minutes, until the clafoutis is puffed and brown and a knife inserted into the center comes out clean. 7) Sprinkle with icing sugar and serve warm.